For preparing this yummy mutton recipe, take a large bowl and add minced mutton in it along with the spices - red chili powder, ginger powder (1/4 teaspoon), aniseed powder (1 teaspoon), yogurt (1 tablespoon), oil (2 tablespoons), black cardamom seeds, chickpea flour and half of the salt. Knead well with your hand till the spices are well blended and the mixture starts to grease your hands. Make 15 equal portions of the mixture. On a flat greased surface, roll each portion gently into round ball. Put these aside. Next, put a deep pan on medium flame and heat 4 tablespoons of oil in it. On the other hand, mix red chilli powder and yogurt together and make a paste of it. When the oil is hot enough, add the yogurt paste and stir briskly. When the oil separates, add the water and stir again. Add the remaining ginger powder, aniseed powder and garam masala powder, cloves, bay leaves, black cardamom skins and the remaining salt into the pan. Cook till the gravy comes to a boil. Carefully slide in the koftas, one at a time and cook on high flame till the gravy starts to thicken. Lower the flame and cook, stirring gently till the oil separates. 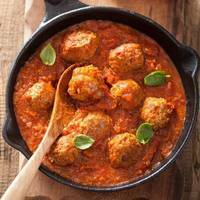 When the mutton kofta is cooked completely, serve it hot with rice or butter naan.